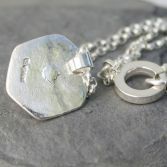 Also available with a blue black oxidised finish please use the drop down option to select finish. 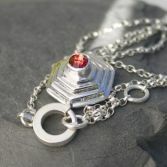 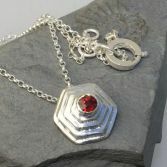 The Pyramid Hexagon Gemstone Necklace is currently made to order and can be make with differnent gemstone options. 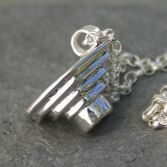 Please allow 6-8 working days from date of ordering. 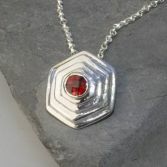 Your Pyramid Hexagon & Gemstone Necklace will be presented to you in one of our signature gift boxes and posted via Royal Mail Special delivery (signed for) to any UK address free of charge.